Warwick House Guest AccommodationYour hosts Nerys and Glenn would like to extend a warm welcome to our family friendly accommodation in Llandudno. The hotel decor is in keeping with the Victorian style of the building, whilst still maintaining the comfortable, friendly, relaxed atmosphere. The welcoming Lounge Bar offers a traditional and varied selection of alcoholic and non-alcoholic beverages in a comfortable setting - the ideal place to unwind and make new friends.” The Warwick Hotel has been in the family since 1942, and has seen many guests return time and time again, becoming good friends. "The delightful Breakfast Room overlooks the hotel garden, and is a perfect setting in which to satisfy a small or hearty appetite. Your comfort and enjoyment are our main concern and you can be assured we will do all we can to make sure your holiday in Llandudno will be memorable. All of the 14 tastefully decorated bedrooms are en-suite. Colour TV in each room. Unlimited Tea and Coffee making facilities. Hair Dryers, Clock radios & Ironing facilities available on request. Your hosts Nerys and Glenn would like to extend a warm welcome to our family friendly accommodation in Llandudno. The hotel decor is in keeping with the Victorian style of the building, whilst still maintaining the comfortable, friendly, relaxed atmosphere. 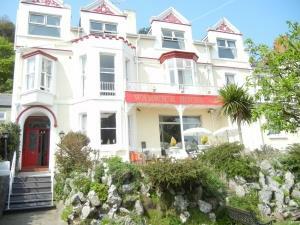 Llandudno is a very popular resort and is an excellent base for a touring holiday. We have a multi screen cinema, excellent theatre, swimming pool, leisure centre and good selection of shops both local and larger stores. The famous Copper Mines, dry ski slope and toboggan run on the slopes of the Great Orme are also very popular and the Great Orme Tramway will take you to the summit or the more adventurous may wish to take a ride on the cable car. Regular boat trips are available to book from the pier and also coach trips to various surrounding attractions including Snowdonia National Park, the Isle of Anglesey or one of the many lovely villages including Betws-y-Coed and Swallow Falls. Day trips to Dublin from Holyhead are also very popular where you can relax have a meal and enjoy the scenery or ‘shop till you drop’ before stopping at one of the many local pubs for a glass or two of the local brew. Children welcome from age 2.